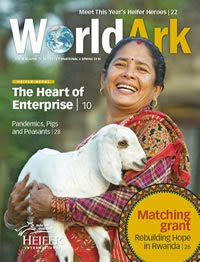 The summer issue of World Ark magazine will hit mailboxes in less than two weeks. Before it does, take a few minutes to revisit the spring issue online. Donna Stokes took us to a women's project in Nepal. Ragan Sutterfield looked at Haiti's pig extermination in the 1980s, much like Egypt's in 2009. World Ark revealed its annual list of Heifer Heroes. Next Article The Coming Cassava Famine?